All Clear? | Marketfy or install Google Chrome Frame to experience this site. Marketfy > State of the Markets > All Clear? Other than that, the signals have been pretty darn good with some of the best coming in October 2002, March 2009, and March 2, 2016. On average, the S&P 500 would have gained 12.6% in the 6-months after a signal (versus the average for all 6-month periods of 4.72%) and 18.4% a year after the signal (versus 9.87% for all 12-month periods during the time frame tested). In addition, one of my favorite long-term "state of the market" signals - which measures the "technical health" of the S&P's 150+ sub-industry groups - flashed a new buy signal last week. While the "timing" of the signals from this indicator aren't always great from a short-term perspective, history shows that when the majority of the market's sub-industries are in good shape from a trend standpoint, the stock market tends to produce above-average returns. So, the bottom line here is for anyone with a longer-term time horizon (6-12 months), these signals provide reasons to be optimistic about the future. But... (You knew that was coming, didn't you?)... It is also important to recognize that everything isn't completely rosy from a near-term perspective and that after the recent joyride to the upside, some sloppy action might be in order. Exhibit A in my argument here would be the fact that stocks are overbought from a near-term perspective and are quickly approaching such a state from an intermediate-term view. This is not a reason to be bearish, mind you, but rather a reason to look for the bears to return to the game at some point soon. Lest we forget, the "Crash Playbook" tells us that the stock market tends to "retest" the "emotional/panic lows" once the "dead-cat bounce" has run its course. And with the help of a little hindsight, it is now clear that Christmas Eve marked the "emotional/panic low" and that what we are seeing currently could very well be termed a "dead-cat bounce." Yes, there have been times in history where the so-called retest was either hard to see or nonexistent (aka a "V" bottom). However, the vast majority of times that stocks got hit as hard as they did during the fourth quarter of 2018, the original reason for the decline tends rears its ugly head a time or two in the ensuing 3 months. No, the lack of positive readings on this board does not mean that stocks are bound to head lower from here. It simply suggests that all is not right (yet) with the indicator world and that some caution remains warranted. You know, just in case any of the original reasons for the -19.8% drubbing rears its ugly head again soon. On that note, recall that #GrowthSlowing was one of the big-3 drivers of the bearish dance to the downside seen from October through December. The bulls argue that the other two problems (the worries over a "Fed Overshoot" and the trade war dragging the global economy down) have been - or are expected to be - "handled." However, the annoying little issue of a slowdown in both economic and earnings growth should be respected as the source of at least a potential problem again at some point. For example, over the weekend, we first got word that China's official growth rate for 2018 was the slowest in 28 years. In addition, the IMF cut their forecast for global growth - again. And then there is the earnings parade here in the U.S. to consider, which is by no means complete. While it is true that earnings season is off to what is being referred to as a "good start" - largely because bank earnings weren't as bad as folks had feared - the meat of the season is yet to come. So, call me a Nervous Nellie if you must, but I would prefer to see the reports from the big boys and her their thoughts on the outlook for business going forward before throwing to the wind, backing up the truck, and buying with both hands. So, getting back to the question at hand, are the bulls in the clear? The answer is most likely, yes - IF one has the proper time frame. However, given the issues still at hand, there just may be a struggle or two to deal with in the near-term. My apologies for sounding like a broken record, but for the third week in a row, there is an important change on the Primary Cycle board. Unfortunately, this week's change is to the downside. 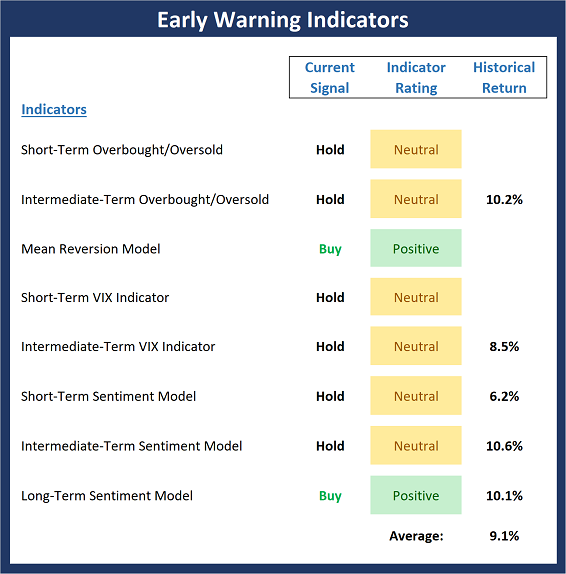 While stocks are enjoying a robust rally, the Risk/Reward model slipped back into negative territory and flashed a buy signal. 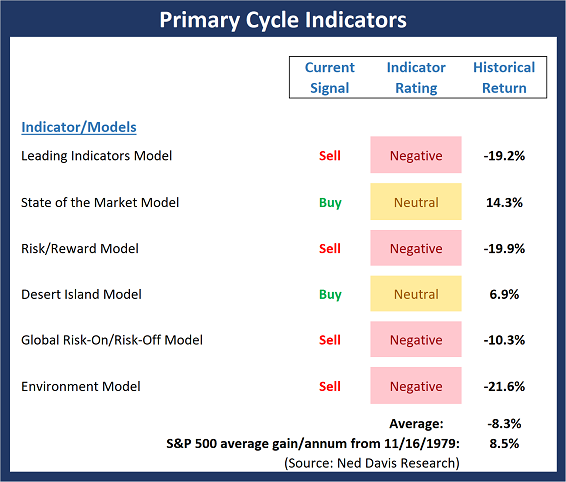 And although the rally is young, I would feel a lot more comfortable if a couple more of my favorite models would move to the buy side and if some of the indicator ratings would turn green. This week's mean percentage score of my 6 favorite models fell to 41.9% from 46.1% (2 weeks ago: 40.3%, 3 weeks ago: 36.5%, 4 weeks ago: 41.9%) while the median declined to 40.0% from 55.0% (2 weeks ago: 50.0%, 3 weeks ago: 44.0%, 4 weeks ago: 44.2%). There can be little argument that after an impressive pop to the upside, the state of the stock market's trend has improved. 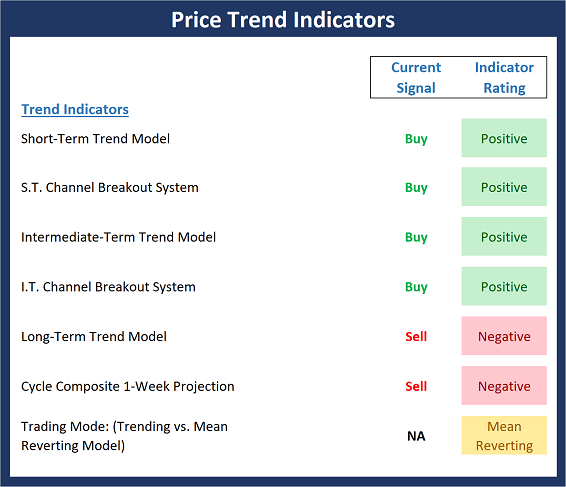 In fact, both the short- and intermediate-term trend models are now rated as positive. However, the long-term picture still has a fair amount of work to do before turning green and the historical cycles point down for the coming week (before returning to the upside for the following two weeks). 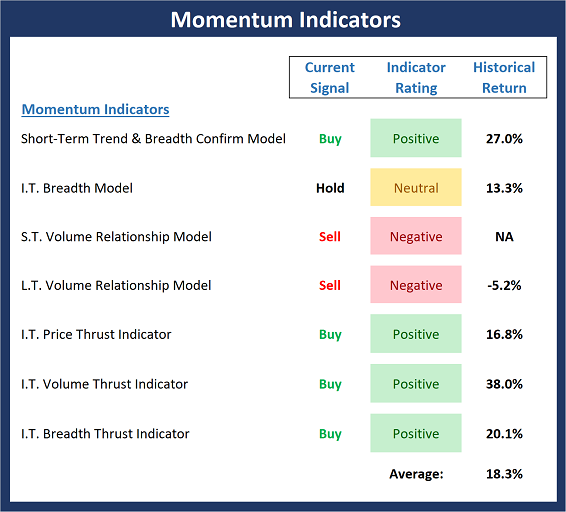 While not all indicators on the Momentum board are not positive (yet? ), it is worth noting that all have improved substantially over the last 3 weeks. For example, while the Intermediate-term Breadth, Short- and Long-term Volume Relationship models are not green here, all three are within shouting distance of buy signals and positive readings. Stocks are currently overbought from a short-term perspective and almost any decline will trigger a sell signal from our s.t. overbought/sold model. In addition, investor sentiment, which had recently reached the "it's so bad that it's good" zone, is no longer a tailwind for the bulls. The bottom line here is stocks are ripe for a pullback. 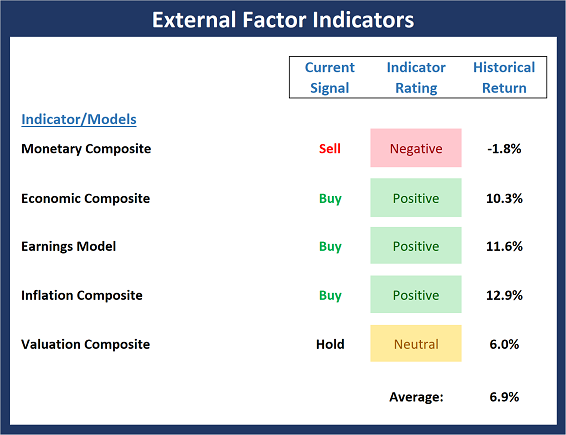 Although the major stock indices continued to power ahead last week, our External Factors board, which looks at the fundamental drivers of stock prices, experienced a setback as the Monetary Composite slipped back into the negative zone. Overall, the board remains in pretty good shape. However, if the bulls are thinking about a new leg higher in an ongoing secular bull cycle, I'd like to see more green here.